The year 2013 saw a number of positive developments in regional and global cybersecurity discussions including the Initial Set of OSCE Confidence-Building Measures (CBMs) to Reduce the Risks of Conflict Stemming from the Use of Information and Communication Technologies of the Organization for Security and Co-operation in Europe (OSCE). At the same time, this policy debate continues to face the significant challenge that the Internet Society describes as follows, “as a catchword, cybersecurity is frighteningly inexact and can stand for an almost endless list of different security concerns, technical challenges, and ‘solutions’ ranging from the technical to the legislative,” highlighting the need for a better understanding of what is meant by cybersecurity. 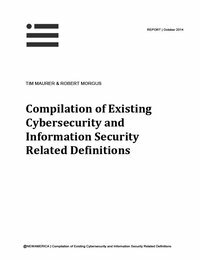 The goal of this study is to contribute to greater clarity and an understanding regarding terminology related to cyberspace and cybersecurity by offering a collection of existing definitions of related terms primarily provided by international organizations or standard setting bodies as well as by states through national (cyber-) security strategies and documents. These are complemented by terms from a few selected other sources such as the Oxford Dictionary on Computing. It will also contribute to Tim Maurer’s participation in the Freedom Online Coalition’s cybersecurity working group “An Internet Free and Secure” focusing on ensuring the protection of international human rights as part of the international cybersecurity debate. In addition, the report and website are designed to be a resource to a much broader audience of policy-makers, academia, civil society, and the press. Explore the definitions in our new Global Cyber Definitions Database, download the data, or submit additional definitions.